Syllabus of the Online Course (Subject): Economy, foreign trade, and investment in the Asia-Pacific Economic Cooperation (APEC) Region. Bogor Goals 2010. Description of the Online Course - Asia-Pacific Economic Cooperation (APEC): economy, foreign trade, and investment. The Asia-Pacific Economic Cooperation (APEC) members agreed to follow this goal by reducing foreign trade and investment barriers and promoting free flow of products, services, and capital. These targets are the “Bogor Goals,” an ambitious expression of common belief of the Asia-Pacific Economic Cooperation (APEC) that a free and open trade are fundamental to realise the potential economic growth of the Asia-Pacific region and improve the economic and social results for all the APEC economies. The total exported products by the APEC economies has risen substantially from USD 2 trillion in 1994 to USD 5 trillion. In the same way, total imports increased from USD 2 trillion to USD 5 trillion over the same period. Since 1994, total trade in products of the APEC with the rest of the World has augmented at an annual rate of 7.1% (for both exports and imports). 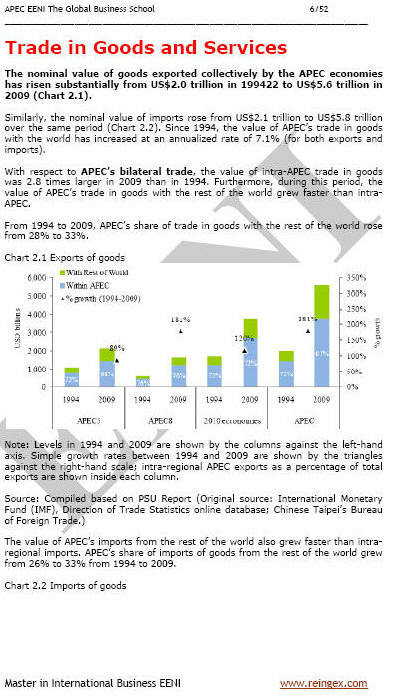 With respect on Foreign Trade, the value of intra-APEC trade in products was 2.8 times larger in 2009 than in 1994. Total trade in products of the APEC with the rest of the World grew faster than intra-APEC. From 1994 to 2009, the share of foreign trade in products of the Asia-Pacific Economic Cooperation (APEC) with the rest of the World rose from 28% to 33%. Total imports of the APEC from the rest of the World also grew faster than intra-regional imports. Trade in commercial services is becoming more and more important across the APEC region. The total commercial services exported by the APEC region augmented considerably from USD 432 billion in 1994 to USD 12 trillion (annual growth rate of 7%).